ORANGE COUNTY, Calif. – An experienced Christian moviemaker plans to release a film this September which he hopes will be ‘an excellent discussion starter’ on the creation/evolution debate. Rich Christiano is a filmmaker in southern California who has directed a number of popular Christian movies, including the award-winning 2009 film, The Secrets of Jonathan Sperry. Many believe Christiano’s latest project, titled A Matter of Faith, has the potential to powerfully impact the Christian church and the culture at large. The subject matter of A Matter of Faith, Christiano told Christian News Network, is the evolution versus creation debate. The film’s plot centers around a Christian girl who is influenced during her first year of college by an evolutionist Biology professor. When the student’s father notices his daughter drifting from the faith, he decides to do something about it and agrees to publicly challenge the professor in a debate. Christiano told Christian News Network that A Matter of Faith will likely spark widespread discussion on the creation/evolution debate once the film is released in theaters September 26. The crux of the evolution/creation debate, Christiano said, ultimately comes down to a simple question: “Who are you putting your faith in? Darwin? Or God?” Christiano hopes the message of the film will resonate with Christians across the country. Christiano also hopes the film will arouse an increasingly apathetic Christian church to a greater zeal for God and the gospel. In order to spread the word for A Matter of Faith, Christiano is asking Christians across the country to sponsor the film in local theaters. Though the release date is still over three months away, many Christian leaders who have previewed the film are praising its biblical message. 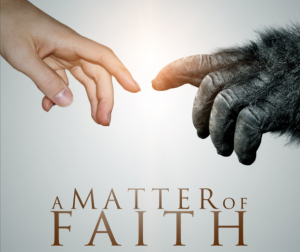 Both Ray Comfort and Ken Ham describe A Matter of Faith as a must-see. The response from pastors and Christians across the country, Christiano told Christian News Network, has already been very encouraging. “God’s raising up a great group of people here that are helping us,” he said. Nevertheless, Christiano stressed, there is still a need for many more sponsors. Those who are interested in bringing A Matter of Faith to local theaters are encouraged to explore the film’s website for sponsorship details and more information about the film. By September, Christiano hopes the film will be released across the country and impact countless lives with its biblical message. Editor’s note: Christiano welcomes questions about the film via email at rc@christianmovies.com.